In the latest non-stop action caper of the year, the breakout stars of DreamWorks Animation’s hit “Madagascar” movies get their own big screen comedy-adventure, in which the stakes couldn’t be higher for the Penguins. Their globetrotting adventures take them to Antarctica, Venice, the desert, Shanghai, New York City and … Kentucky), during which they experience glory, engage in espionage, foil an evil scientist’s/octopus’ dastardly plot – and devour cheesy snacks – like no penguins have ever before. In the following q&a, the greatest spy quartet of penguins share on how it was working on the movie and working together for almost a decade. Q: After letting Alex, Marty, Melman and Gloria bask in the spotlight, how does it feel to finally be getting your own movie? Skipper: Somebody’s filming us?! Rico, find those cameras and take them out! Pronto! Q: Did any of them give you tips on how to handle the work and the fame? Skipper: Who’s famous? You didn’t see anything. Next question! And I’m serious about those cameras, Rico! Q: It looks like you again got to travel around the world making this film – what was your favorite place? Skipper: Well, they always say there’s no place like home. But we’re from Antarctica, so forget that. Maybe Venice? Private: We got to ride a gondola! Skipper: We sure did, you adorable ragamuffin. Q: It appears you’ve created quite the enemy in Dr Octavious Brine… what’s his problem? Skipper: I know, right? Wait, was that an actual question? Oh. Ehh, who knows? I stop paying attention when villains go into the “blah blah here’s my story blah I’m so angry blah.” Wake me up when there’s something to rescue and/or eliminate. Q: To help bring him down, you teamed up with professional spy Agent Classified. Who’s smarter? 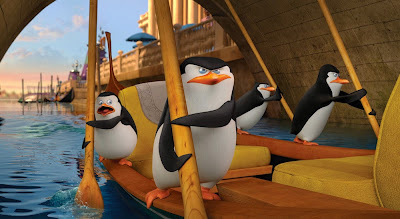 Skipper: I’m gonna let Kowalski field this one. 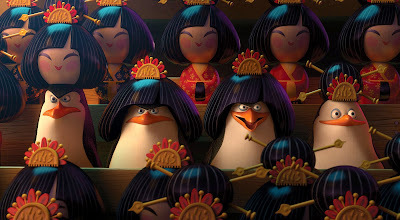 Say something smart, Kowalski. Kowalsko: Covalent bonds, Planck’s constant, ziggurat, flagellum. Skipper: I rest my case. Q: Without giving too much away, what was the hardest part about trying to bring down the Dr? Skipper: Well well, you’re just chock-full of questions today, aren’t you? WHO SENT YOU?! WHO ARE YOU WORKING FOR?! Rico, where are those cameras, man?! Q: The four of you have been working together now for almost a decade – do you still get on? Private: I can’t believe you told him that! Skipper: --but other than that, we’re good. 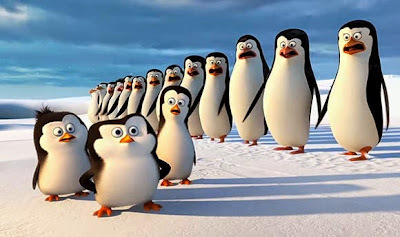 Q: You guys have always been popular – why do we love penguins so much? Skipper: How about you stare into Private’s adorable face for 30 seconds and tell me if you still need to ask that question. Q: Do those penguin documentaries really tell us all we need to know about you, or is there one secret you’re holding back? Skipper: Ohhhh, yes. We’ve got one secret. A secret so big, it’ll blow your mind. Would you like to hear it? Well too bad, because Rico finally found your cameras. Take ‘em out, Rico! 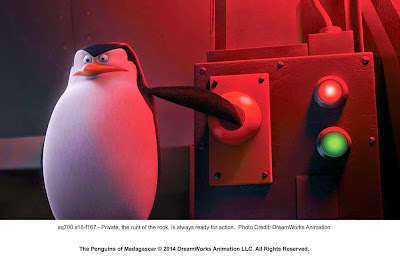 Opening soon this November 26 in 2D, 3D and IMAX screens, “Penguins of Madagascar” is a Dreamworks Animation feature and 20th Century Fox to be distributed by Warner Bros.